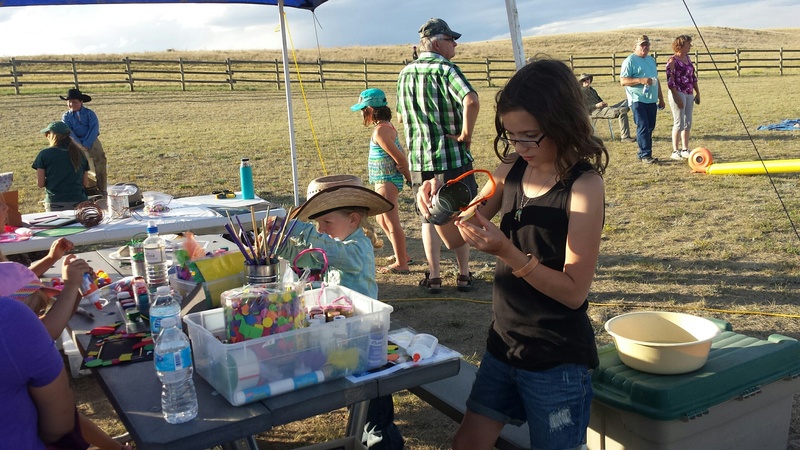 The Sleep Under the Stars Party in the West Block of Grasslands National Park is a family activity not to be missed! 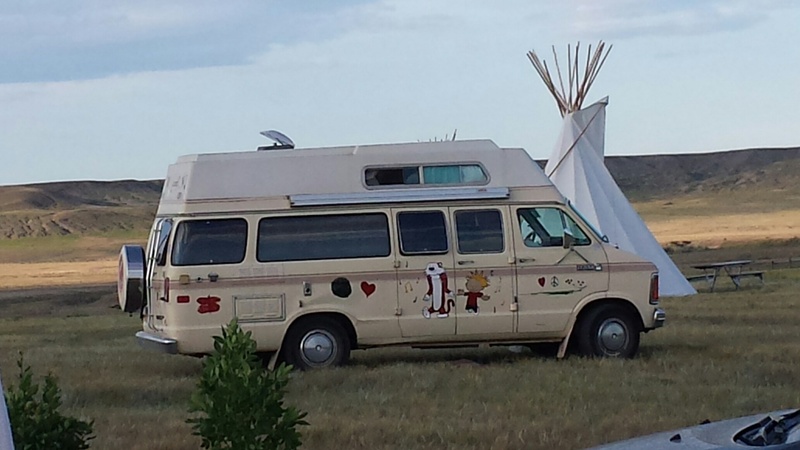 My 11 year old daughter and I packed up the camper van, (fondly named CalVan), and headed due south from Swift Current to take in the 2015 event from July 24-26th. The sixty minute drive to Val Marie went quickly… the ripening fields rippled like a living ocean of grain. The road became a thin blue ribbon across the beautiful, raw prairie as if in a sea of wild flowers, sage and short grasses. The multitude of colours were absolutely stunning. We stopped at the Visitor Centre in Val Marie, picked up the park map and then headed east for another 30 minutes to the Park Entrance. The flat prairie had given way to rolling hills and, once inside the park, we were treated to the stunning vista of the Frenchman River Valley. This enormous trench is home to many wild animals including bison, deer, rattlesnakes, the endangered black footed ferret and prairie dogs, which are also unique to this part of Canada. 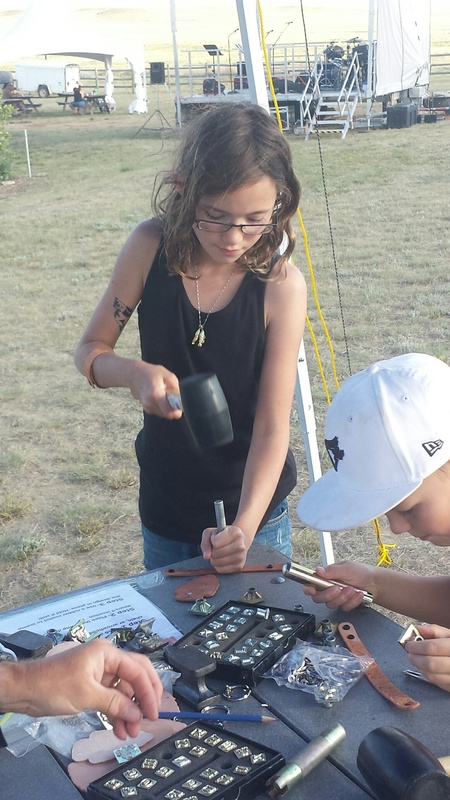 Black footed ferret presentation and walk at 10 p.m. There are a limited number of camping pads at the site, but the difference between the on-pad camping and overflow is minimal. The on-pad campsites are level gravel (as opposed to the level prairie a few feet away! Lol) and there is a hook for hanging a lantern, a picnic table and a fire pit, and electrical. With a long enough extension cord, you could possibly plug into someone’s electrical box. I asked my camping neighbour if I could charge my cell phone at their site… I left it there to charge and went to have breakfast. A sprinkling of rain came through, but I had forgotten about my phone sitting on the box! When I came back, my neighbours had put my phone in a zip lock bag for me! How very Canadian! Thank you!! 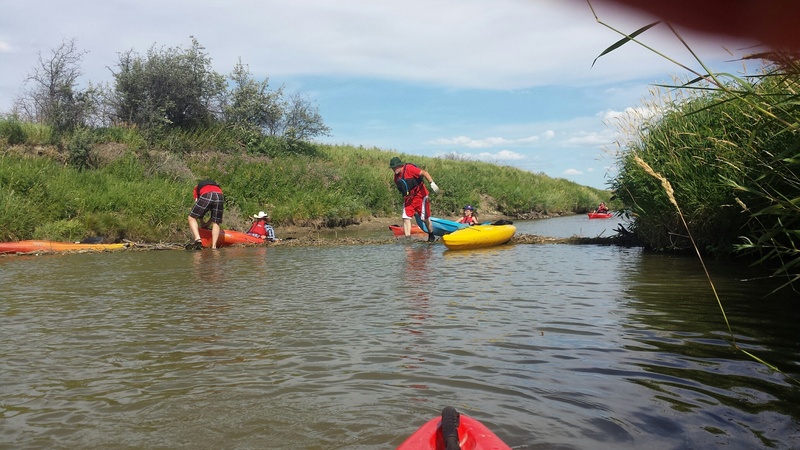 Upon arrival at the Frenchman Valley campground, we were immediately greeted and signed up for the kayaking trip along the Frenchman River. 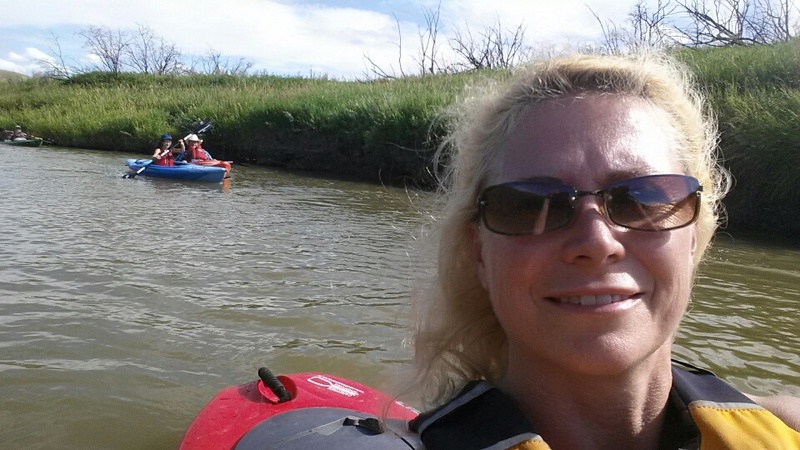 With a group of about 15, we leisurely paddled down the river about 30 minutes, then back again. Unfortunately, the lack of rainfall that summer had left the depth of the river to about 12 inches in a few spots and the kayak would just squeak over the bottom. But the trip was good for the beginner kayaker, with no current to speak of, and my daughter (the youngest of the group) didn’t have any trouble negotiating the water. The guides even treated us to the world’s easiest portage! At a beaver dam, they got out and pulled us over the sticks and mud so we didn’t have to do anything! Awesome!! 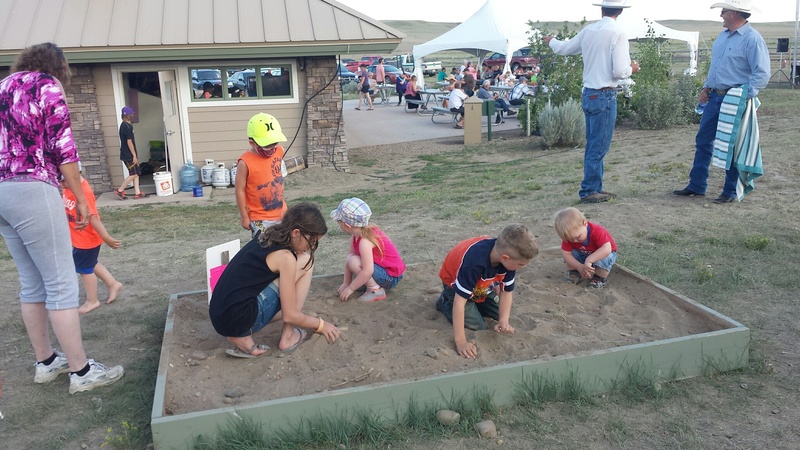 My daughter spent a good couple of hours crafting and digging for bingo chips in the sand pile (which kids could trade for prizes… we have a flotilla of bison now!). This activity was perfect for the 5-12 year old set while we were waiting for the bbq supper. The band warmed up and played a pleasant assortment of 80’s style country cover tunes and a few original folk songs as well. We enjoyed the supper (with apparently as many trips back to the buffet as you wanted) while many people took to the outdoor dance floor. After supper, we went on a tooth-rattling wagon ride over the top of the prairie ridge – it sure gave both of us an appreciation of how the first settlers would have travelled!! 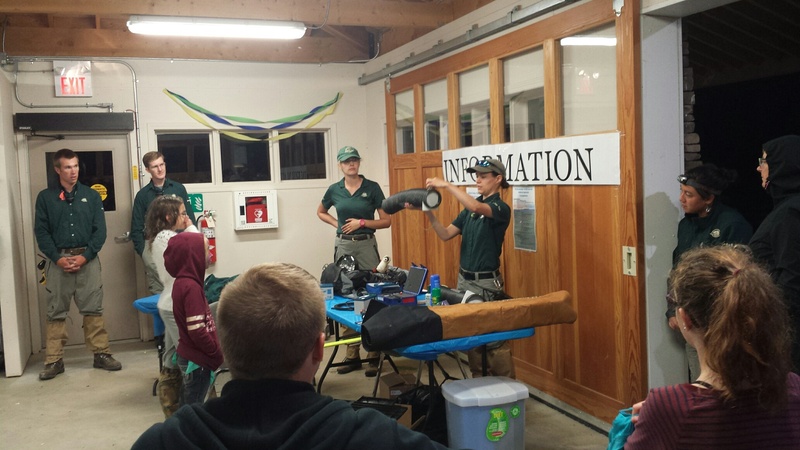 Around ten o’clock, the interpreters gave a presentation on the endangered black-footed ferrets of the area and the re-introduction program to bring back these animals to the prairie. They had been believed to be extinct but a few were found in Wyoming in the 1980’s, and 18 ferrets were captured for a breeding program in order to save the species. The kits have been re-released in the wild in Saskatchewan at Grasslands, in the western States and Mexico. They hunt, almost exclusively, prairie dogs and so are a critical element of the prairie ecosystem. The interpreters explained the re-introduction program and then we were handed gaitors for our lower legs (the explanation was they were necessary for the ‘rough terrain’, but I greatly suspect it is for rattlesnakes!!). Then a group of about 40 of us headed out into the prairie dog town to try to spot a ferret. Ferrets are nocturnal and hunt at night, and they are tracked by using spotlights to catch eye-shine. The interps gave us the coolest little flashlights which can pivot to become a lantern too!! With all the stealth mustered with a group of 40 people crunching over the prairie, gaitors zipping along, we ventured into the dark in groups of 10. Our group had a very chatty guy who simply would not stop asking questions, and I was becoming annoyed that we were NEVER going to see a ferret at this rate!! Then suddenly, the flashlight caught eye shine!! We all froze and became quiet as cats as we stalked up to our tiny furry quarry. Closer and closer…. Once we got within a few yards, I began to wonder when this thing was going to bolt! But then we saw that it was just a cardboard cut-out with reflectors on the eyes!! While it was funny and a little disappointing, it was still a good lesson. This is EXACTLY what the interpreters do, for hours in the dark. It would have been very disappointing if we had spent an hour in the dark wandering the prairie with no reward. But this prank made the activity memorable and educational too! Grasslands Park has the official designation as a Dark Sky Preserve, and is the largest Dark Sky Preserve in Canada. Light pollution affects the behaviour of many animals, including the nocturnal ferrets, so maintaining dark sky preserves is a critical part of their survival. Members of the Royal Astronomical Society were on hand with their telescopes and treated us to amazing celestial sights. We wandered back to our camper around 1:30 in the morning after a very full and fun day! One of the most impressive things about this trip was the staff. They were knowledgeable, attentive, and worked very hard, long hours! They were there until after midnight following the ferret walk, and then up early to prepare the pancake breakfast the next day! I was struck by how dedicated and engaged they all were with their jobs, and their positive attitude greatly contributed to our experience! Take Highway 4 south from Swift Current, SK and don’t turn the wheel for 90 minutes! The single lane highway evolves from very good, to good, to narrow and bumpy, but it is paved with . When you get to Val Marie, the road east to the Park is actually a few hundred metres before the Park Visitor Centre, but the Centre is worth the stop. It is staffed with friendly and knowledgeable interpreters, lots of pamphlets, some souvenirs, and a small interpretive centre. 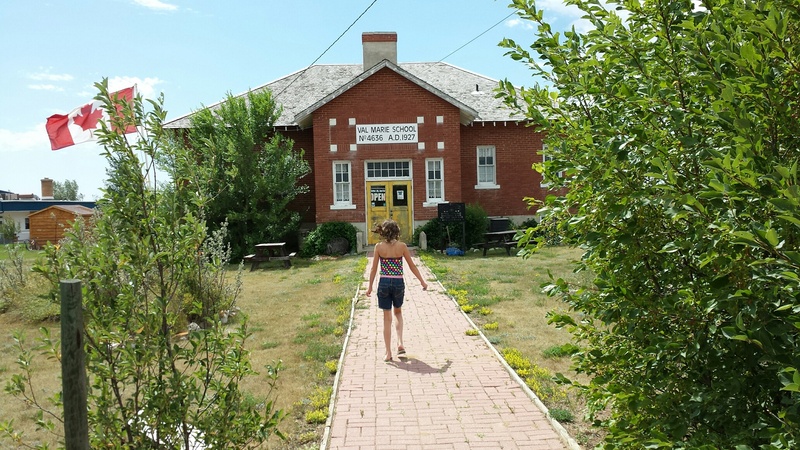 Across the street is the Prairie Wind and Silver Sage gift and coffee shop, located in the old school house. This is WELL worth a visit!! My daughter and I spent over an hour there, looking (and buying) books, puppets, t-shirts and other souvenirs, plus they make a decent latte and chai latte!! There is also an interpretive centre here too. 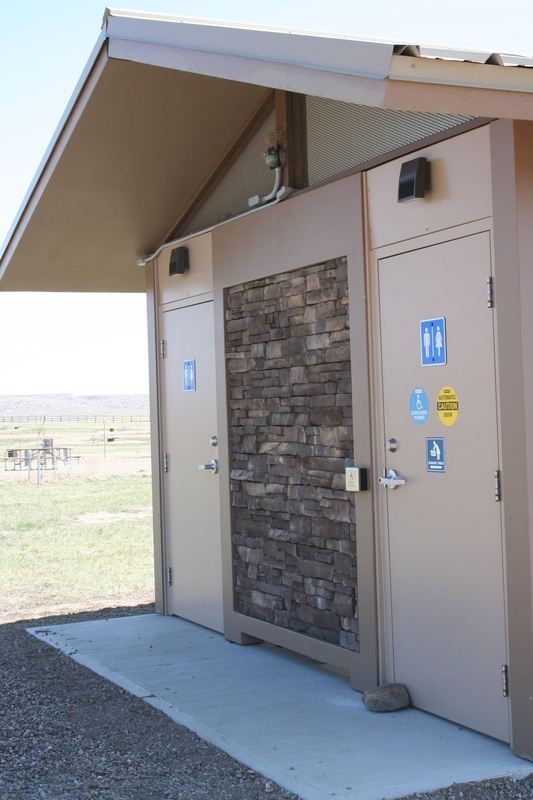 There are 2 very clean, large and well-lit bathrooms at the camp site. These are outdoor toilets but there is running potable water. There is also a dump facility for campers. This is probably only of the least expensive places to camp! Overnight fees are only $15.70 (cash or cheque only) and there are NO park entrance fees!! If you are travelling with a large camper, be aware that the last 18 km is on gravel and there are a couple of steep hills in and out of the Frenchman River Valley. In wet or rainy conditions, this would be a difficult road for a fifth wheel. Rattlesnakes are a part of the ecosystem here. It would be advisable to wear closed shoes and long pants or gaitors if you are planning to do any hikes. Remember you are also in bison country. The campsite itself is enclosed in a fence. I remarked to my daughter that we were the animals in the pen! The Frenchman Valley campsite has only 20 campsites available on a first-come, first-serve basis. Only 4 have electrical hookup. Overflow camping is not a problem as most areas are flat and level. s which are available only by reservation. Next time I would rent a tipi with equipment! There is potable water available at the Frenchman Valley campground, and a good cooking shelter. Note that cell phone coverage is spotty. I didn’t have a connection in the campsite itself, but did once I walked up on top of the valley. For Geo-Cachers, there are programs for both kids and adults. If you don’t have a GPS, you can rent a unit at the Visitor Centre in Val Marie. We didn’t have time to do this, but next time, I definitely would – the collectible coins are beautiful! !